You may have seen many actors who are good at getting into the skin of the character and delivering it well in front of the camera. But there are also certain actors who are good at performance and imitation of their colleagues as well. One name that belongs to the list is that of Mass Maharaja Ravi Teja. 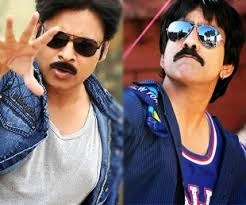 The latest news coming from his close circles is that Ravi Teja has imitated power star Pawan Kalyan in his new movie 'Bengal Tiger'. This is being directed by Sampath Nandi and the shooting will take place at Kolkata. Inside sources reveal Ravi Teja has imitated Pawan's dialogue delivery and body language which is going to entertain the audience a lot. This is not the first time Ravi Teja has done it. If you can recall, in the film 'Balupu', the Mass Maharaja ended up imitating Nandamuri Natasimham Balakrishna's style of dialogue delivery in a scene. Let us wait to see how the power star fans will receive this act from Ravi Teja.